Hampden Academy coach Russ Bartlett gives instructions to his team during a timeout in the Class A North final against Medomak Valley at the Augusta Civic Center on Feb. 23, 2018. 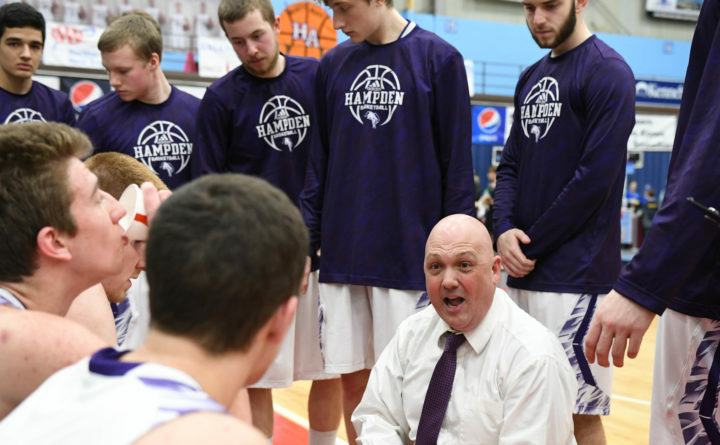 Hampden Academy boys basketball coach Russ Bartlett has surpassed 250 career victories. The 1995 HA graduate now boasts a varsity record at his alma mater of 252-68 — a .786 winning percentage — after the Broncos’ 77-49 victory over Messalonskee of Oakland on Tuesday night. Win No. 250 came Dec. 21 when Hampden defeated Brewer 71-39. While the milestone is significant as a standalone achievement, what makes Bartlett’s record even more impressive is the modest amount of time it took him to reach 250 victories. Bartlett is midway through his 16th year as Hampden’s head coach, meaning his teams have averaged 16.3 victories per season. The regular-season schedule is just 18 games. Hampden is 222-56 during regular-season play under Bartlett, a .799 winning percentage. His teams are also 30-12 (.714) in the postseason with three Class A state championships and seven East/North regional titles. Hampden, the defending Class A North champion, is 7-1 this year and entered Wednesday night’s schedule ranked third in the division. Thursday’s Bangor-Hampden contest is not the only major game on the boys basketball docket later this week. Ellsworth visits Mount Desert Island of Bar Harbor on Thursday in the first of two battles between Class B North’s two Hancock County rivals. Both rank among the top four and the top five teams earn preliminary-round byes. MDI (6-2) is ranked third, its lone losses coming at 5-4 Foxcroft Academy and with a split against No. 5 Oceanside of Rockland. Ellsworth (6-3) sits between MDI and Oceanside in fourth place, with its lone losses coming to No. 1 Hermon, No. 2 Caribou and No. 6 Orono. Hermon, the defending Class B state champion and owner of a 30-game winning streak, hosts Oceanside at 3 p.m. Saturday in a rematch of what may be the game of the season in the region to date. Coach Mark Reed’s 8-0 Hawks outlasted Oceanside 97-94 in triple overtime in their Dec. 21 meeting at Rockland behind 31 points from junior forward Isaac Varney. Seniors Kent Johnson (19 points), Joel Bergeron (17) and Cody Hawes (15) also played key offensive roles. Senior Cooper Wirkala had 39 points, 17 rebounds and eight assists in that meeting for 7-2 Oceanside. Outside of its three-point win at Oceanside, Hermon has outscored its other seven opponents by an average of 21.4 points this season. At 7 p.m. Saturday, Mattanawcook Academy of Lincoln (6-0), the lone undefeated team left in Class C North, plays three-time defending Class C state champion George Stevens of Blue Hill. Mattanawcook, coming off a 41-34 victory over previously unbeaten Dexter last Thursday, is ranked fourth. Coach Lucas Turner’s Lynx have perhaps the most experienced team in the division with a cast of five senior starters led by point guard Alex Brown. Coach Dwayne Carter’s fifth-ranked GSA team (7-1) counters with considerable postseason experience from the likes of seniors Percy Zentz, Reece Dannenberg and Isaac Wardwell along with junior Caden Mattson.